*Well, unless something is actually screaming “eat me” which would be more than just a little disconcerting. 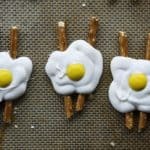 It just doesn’t get much cuter than these little “Bacon and Eggs” candies that I saw years ago in Taste of Home and again at What Megan’s Making. And it doesn’t get much easier, either. You need three ingredients. Just three. You need about ten minutes, including clean-up. In short, you get a big, adorable pay-off for a very small commitment. Let’s talk options, shall we? I’ve seen them made with white chocolate or white baking chips, but I’m not a big fan of either of those, so I substituted yogurt candy chips. These are often available in bulk sections of better stocked groceries or in candy making supply aisles in crafting stores. Of course, if you are a white chocolate lover, don’t knock yourself out sourcing the yogurt candy chips. It turns out looking just as cutesy with the white chocolate. There is just one problem, though. They’re a little too easy to eat. May I suggest you make them before Easter to pop into baskets or take to fellowship hour so that you don’t eat them all yourself? Unless of course you have self-control, which I don’t. As soon as these little beasts were finished setting up, I bagged them and tied the bags with a double knot. I know myself. This was crucial. For my fellow chicken owners, it’s two egg jokes (or yolks) in one. Orange you glad I did it? It’s a double yolker. I crack me up. You might want to tell me to stop now because I have some eggcellent puns. Alright. Now, shell you goo make yourself some candy? One, two, three: SCRAMBLE! This uber-cute candy is done in about five minutes and only requires three ingredients. Tuck some into Easter baskets or surprise your favorite sweet-tooth with a plate of these tonight. Lay silpats, parchment paper or waxed paper on three cookie sheets. Arrange pairs of pretzels side by side with a small space between them on the prepared cookie sheets. Put yogurt candy baking chips (or white chocolate or white chips) into a microwave safe bowl. Heat at about 70% power for 1 minute. Remove from microwave, stir, and return to the microwave. Heat at 70% power in 30 second bursts, stirring after each burst, until smooth. 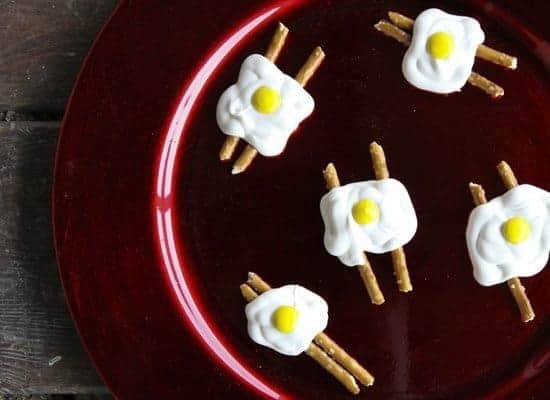 Use a spoon or piping bag to spread about 2 teaspoons of the melted candy over the pairs of pretzel sticks in the rough shape of an egg. 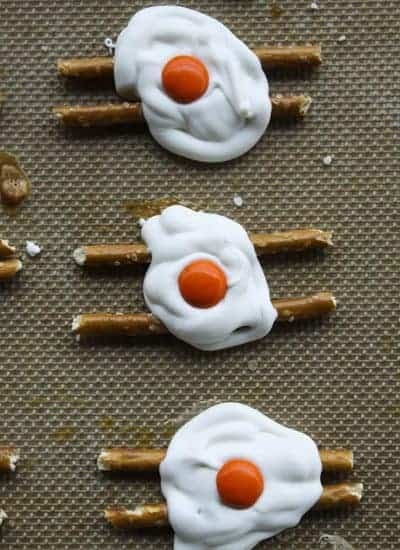 Drop an M&M on top of the melted candy in the center of each pair of pretzels. Let cool and firm completely before transferring to an airtight container for storage at room temperature. Yogurt candy baking discs are found in the bulk or candy making sections at better stocked groceries and crafting stores. If you can't find them, or don't prefer them, use white chocolate or plain white baking chips or melting discs. OMG, that is the cutest idea ever! Adorable. 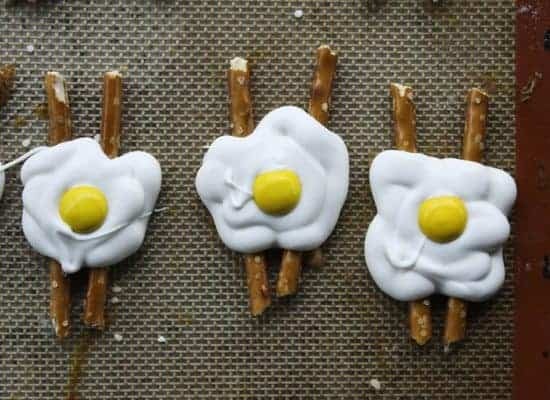 Oh my goodness, I cannot wait to make these!! These are just too adorable. I will have to give these a go some day. Fantastic idea, thanks for sharing.